Access to the temple Lies to the east prakara of Thirunangoor. 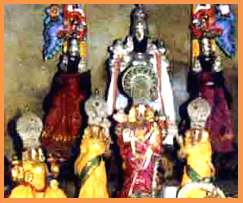 The Moolavar of this sthalam is Perarulalar. Other name are Hema Rangar, Damodharan and Sem Pon Arangar. The Moolavar is in the Nindra (Standing) Thirukkolam facing his thirumugham towards east direction. Prathyaksham for Rudhiran. This sthalam is also one among the Thirunaangur Divyadesam and lies in Thirunaangur in Tanjore district in Tamil Nadu. It's about 5 kms away from Seerkazhi. Bus facilities are also available. This sthalam is called with other names like Hema Rangam, Nagapuri, Nangai Nagaram.